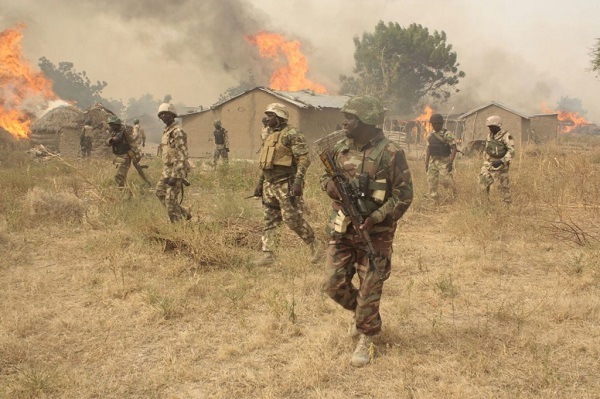 Some gunmen in Nigerian Army uniform yesterday invaded Naka, the headquarters of Gwer West Local Government Area of Benue State, and set over 300 houses ablaze. Also in the early hours of yesterday, Fulani herdsmen launched an attack on Agasha, a community near Governor Samuel Ortom’s district and killed six people. This came as Governor Dairus Ishaku raised the alarm over the increased harassment of people of Taraba State by military personnel sent to fight killer herdsmen operating in the area. The Gwer West Local Government Chairman, Mr. Francis Ayagah, told journalists that the said soldiers stormed the area about 11a.m. and began burning houses. Ayagah could not immediately confirm casualty figures, but said the ‘soldiers’ were on a reprisal over the killing of one of their colleagues near the community on Wednesday. He said: “A soldier was allegedly killed by hoodlums on Wednesday, but I met with the Brigade Commander about 4:30a.m. today (yesterday).” Ayagah added that over 300 houses were burnt. “He gave me a list of suspects and we arrested five of them overnight. It was while we were trying to take them to the brigade that soldiers stormed the town and started burning houses. “A whole part of the town has been completely burnt down and we are appealing for help and understanding from the soldiers,” the chairman said. He added that homes of citizens were mostly affected rather than those of the suspected killers of the soldier. The local government Information Officer, Mr. Francis Ugbede, said a 65-year-old man, who was sick and could not be carried when the soldiers invaded the community, was burnt inside one of the buildings. The operation lasted over two hours within which more than 300 houses and property worth billions of naira were destroyed. Naka is about 45 kilometres from Makurdi, the state capital. Gwer West was attacked a little over a week ago with over 25 people reportedly killed. When contacted, the Assistant Director of Army Public Relations Officer, 707 Special Forces Battalion, Makurdi, Major Olabisi Ayeni, confirmed the incident. Ayeni said: “About 3:30p.m. on “Wednesday, troops of 707 Special Forces Brigade deployed at Naka in Gwer West Local Government Area of Benue State observed the absence of PTE Danlami Gambo from duty post, the soldier’s rifle was, however, found at the location. “It was gathered that the soldier was last seen receiving a phone call but left in search of network and did not return. Ayeni said the body had been exhumed and deposited at the Nigerian Air Force morgue in Makurdi, adding that preliminary investigation revealed that some locals were involved in the killing of the soldier which had led to the arrest of some suspects by a team despatched from the unit to the scene of the incident. He added that investigations were ongoing to unravel the circumstances that led to the soldier’s death and to also arrest all the culprits involved. On the burning of the houses, he said: “Information received revealed that some unknown persons were seen burning houses at Naka. Troops were despatched to the location but they did not make contact with the perpetrators.” Also, the Nigerian Army said it was awaiting briefing on reports that soldiers had set dozens of houses ablaze in a Benue community. In an interview with New Telegraph, the Director of Army Public Relations, Brig.-Gen. Texas Chukwu, said: “I can’t say anything now; I have to ask the people in the field. I’m seriously linking with people in Benue. “The Director of Military Intelligence, up till now, is still liaising. I have already told the Brigade Commander to tell us what is happening.” Meanwhile, the Tiv Youth Organisation (TYO) has condemned the massive destruction of property in Naka by men of the Nigerian Army. President of the organisation, Mr. Timothy Hembaor, who spoke with our correspondent, wondered why the soldiers failed to go after Fulani herdsmen who murdered two soldiers in Tyulen and also claimed responsibility, but preferred to visit mayhem on Tiv villages that had been deserted long ago and taken over by the Fulani insurgents. He said: “Fulani herdsmen had already chased the people in Naka and occupied the place. The action of the soldiers is condemnable. “What has happened has already given us the impression that this is what President Muhammadu Buhari had been looking for; if not Fulani had killed about two soldiers at Tyulen and they even admitted responsibility over the killing and there is no iota of hostility against Fulani herdsmen that are occupying Tyulen and other parts of Guma Local Government Area where those soldiers were killed. “So why are they afraid to go after Fulani militia that killed their men and they are just burning and ransacking Tiv villages because a soldier was killed around the place without investigating to know exactly who is responsible for it?” At least six people were yesterday killed by armed Fulani herdsmen at Agasha in Guma Local Government Area of the state. Thousands of local inhabitants including women and children were yesterday seen leaving their homes in droves to areas considered safe to avoid being killed. Meanwhile, Ishaku, who spoke yesterday after the 79th meeting of the National Executive Committee (NEC) of the Peoples Democratic Party (PDP), said though military had been withdrawn from the Southern part of Taraba State, “we are still being harassed by the herdsmen militia.” The governor disclosed that the military had taken over the job of the police and were bombarding people’s houses at 2a.m., arresting youths and locking them up. He said: “Two of these youths are missing and we understand that they are with the military and being transferred to the Abuja military headquarters. “I asked for the reason, nobody has confronted me with the reason. All I was told was that they committed crime, which crime? Nobody has told me about that as the chief executive and chief security officer of the state. “Nobody has reported this to me. The police are not aware of this. The military has written to the Takum Local Government chairman for him to report to them immediately to be arrested. “I don’t know what is happening. The Armed Forces are not protecting the people against the killer herdsmen, but now going around arresting the youth in the town.” Takum is the local government of former Chief of Army Staff, Lt. Gen. Theophilus Danjuma, who, last month alleged that security agencies were colluding with the herdsmen killing the people. Ishaku said the constant harassment of the people by the military led to the demonstration of the women last week. “Now the situation is getting really bad,” he added. The governor called on the Federal Government to call on the military to bring back the boys who were arrested and allow the police to do their job.